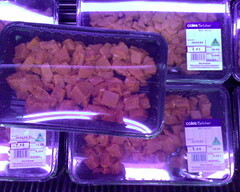 I saw this package of diced beef in the local Coles supermarket. No label stuck to it to indicate price or, more importantly, no used by date. Had intended to mention it to staff as I went though the checkout, but it slipped my mind at the time. Do you think I should email them the photo? Would someone actually do something about it if I did? This entry was posted in Photos, Shopping and tagged Coles, label, meat, Shopping. Bookmark the permalink.